Posted byRed Lips High Heels	 September 19, 2015 Leave a comment on Is Lebanon Ready for a Revolution? Why do many Lebanese let themselves and their country be buried under trash? Why is the general worldview/behavior – except for few individuals and movements who are trying to deconstruct it – quietist, conformist, and ostrich or zombie like? Why isn’t there a collective upheaval that would gather all Lebanese? Is Lebanon ready for a revolution? These are questions my Lebanese and non-Lebanese students ask, questions I keep on asking myself, questions that do not lend themselves to an easy answer, but engaging with them may facilitate critical assessment of the prospects for a sustainable change. I will certainly not implicate myself in entrenching the neo-orientalist/neo-colonialist caricature of Southwestern Asian societies as incapable of self-government, and Southwestern Asian populations as uncivilized and backward, with a genetic pool incapable of mutation, stuck in mythical dark ages. One answer could be the following, as Patricio Aylwin Azocar states: “Ordinary men and women may often feel unmotivated to exert their citizenship, either because they cannot tell the difference between the different alternatives, or because they have lost faith in the political classes, or because they feel that the really important issues are not in their power to decide”. A second answer could be the deification of the political party, the sectarian community and the zaim. As the well-known poet Adonis described it: the sacralisation that colors and creeps into politics, turning parliamentarians, ministers and other public servants into demi-gods, their ideologies into gospels and political parties into sects. Indeed, over the past decades, the legacy of multiple wars in Lebanon, including hypermnesia, and paradoxically the tabula rasa mentality and national strategy, have produced in the minds of a good many Lebanese the illusion that somehow “somebody” – the warlord, the zaim, the political party, the sectarian community/belonging – but not the State (or the embodiment of the common management of our diversity), can provide for ALL needs (if not now, certainly in the future), so why make much effort to fulfill what used to be considered in practice (or are considered in the Constitution) the responsibilities of any citizen? When human beings become ICONS, such as most Lebanese political leaders and public figures, they cultivate and entrench political iconolatry, and that iconolatry is internalized by the common people. Other answers could be easily defined and added. The outcome would still be the same: a national disaster. However, the time is not yet for defeatism. “If beyond hopelessness there is hope, I am hopeful” (Elias Khoury). Hope because even if I believe most Lebanese are not ready for a revolution when this revolution is thought as a general upheaval à la Française or an Arab Spring type of revolution or even a Gandhi style revolution, change-making has already started. Indeed, agents of dialogue, non-governmental organizations, academics, artists and activists, in Lebanon and in the Lebanese diaspora, have been contributing since the 1990s to raising awareness about the necessity of reforming the social-political system and of finding solutions to numerous crises such as the economic, environmental, cultural… They have already started the desacralisation process. What we are witnessing nowadays in Lebanon is one of the many physical manifestations of this desacralisation. The next step would be to continue on expanding the process, while always keeping in mind the necessity of building dialogue platforms. Desacralisation does not mean ‘getting rid of the iconodules, agoraphobics, ostriches and zombies’, but building alternatives (ideas and practices) where a unity in a diversity of voices would be reached. Pushing someone who isn’t ready for change is traumatizing. It is neither successful nor humane. The contrary of building strength within and encouraging exploration that feels wanted and welcome when time arrives. Street protests are certainly a must, but aren’t enough. Non-formal and formal education should accompany the demonstrations, and short-term expectations should be coupled with long-term ones. For the majority of Lebanese to understand what is the value of change, to be able to heal their wounds, to stop cushioning themselves against the rawness of life by staying in controlled boxes ‘safe’ from unwanted intrusion, to choose challenge and the unknown over the known, and to embrace constructive discomfort, time, patience, and multiple continuous knowledge productions and acts for peace, justice and equality are needed. Lebanon’s road from denizenship to citizenship is long, winding and full of detours. We’ll get there eventually! Can’t agree more. Thank you for this ‘justesse’ in the description and pragmatism. Merci pour cet elan positif et realiste. Excellent post Dr. Chrabieh. I agree. Healing wounds take time. And the Lebanese population is indeed wounded. You can’t expect the unexpectable from a person/a people marked by illness thus unable to fight anymore unless a miracle – which i doubt – or the proper medication and care. All Arabs lack a proper education. This is my belief. Or else they would’nt be drowning in garbage or blood. I am sorry Biba but your comment is definetely not helping. Stereotypes only generate hate. Thank you Dr for such enlightening words. Thank you Dr Chrabieh. Always following your posts. Awesome blog and nice input by all the authors. A wonderful initiative. Unfortunately so many lebanese don’t believe in change. For them status quo is the best situation when caught between the war in Syria and the ambitions of Israel. We are not ready but we still have hope. We = many young Lebanese. Sorry to disappoint you Khairallah but i don’t believe most Lebanese are ready for change. 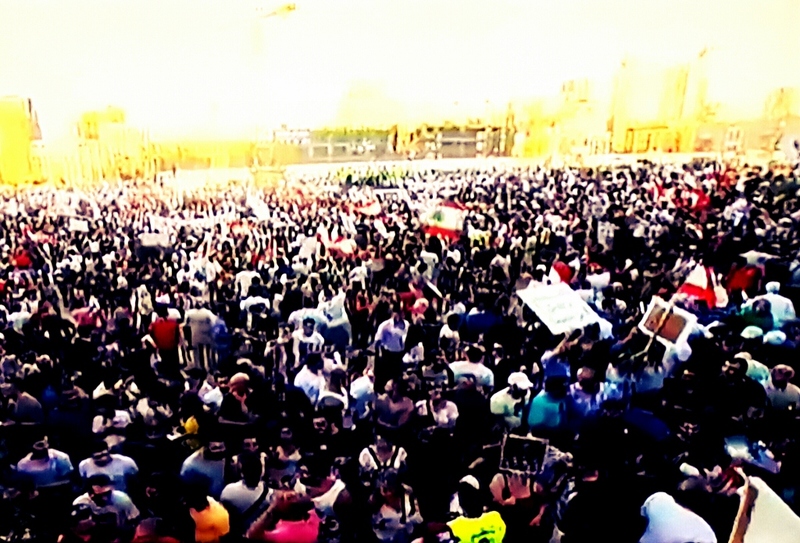 Meanwhile, there are Lebanese in the streets, protesting. Hopefully that would help. I am not living for now in Lebanon but i’m always following the news. Wish i was there to be able to contribute. Allah ya3tikon el 3afye ya chabeb wa ssabaya! Not even a revolution for women – meaning for gender equality! From what I witnessed yesterday evening? Lebanese are still extremely divided. Those who follow their leaders and those who don’t. But those who don’t are still not that many. Meanwhile, we’re drowning under garbage. A revolution is a significant change that usually occurs in A SHORT PERIOD OF TIME.Its results include MAJOR CHANGES in culture, economy, and socio-political institutions. Which I highly doubt in the case of Lebanon given the current circumstances. Young people are ready! Not the older generations. Well, based on what we are witnessing nowadays, i would say also : NOT READY !! Excellent post and utterly relevant!